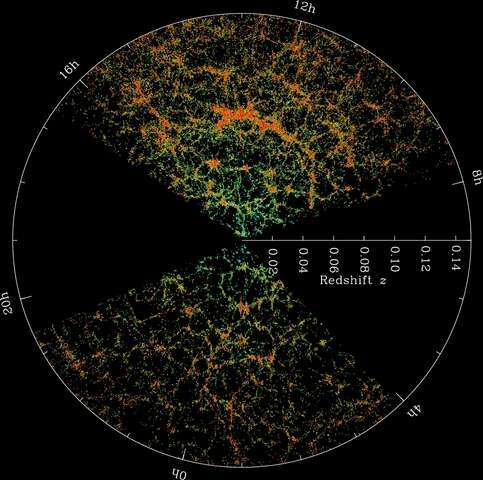 In a 2013 observational study, Ryan Keenan, a postdoctoral researcher at Academia Sinica in Taiwan and a University of Wisconsin-Madison alumnus, and his former UW advisor, astronomer Amy Barger, showed that our galaxy, in the context of the large-scale structure of the universe, resides in an enormous void—a region of space containing far fewer galaxies, stars and planets than expected. The reason for that is that a void—with far more matter outside the void exerting a slightly larger gravitational pull—will affect the Hubble Constant value one measures from a technique that uses relatively nearby supernovae, while it will have no effect on the value derived from a technique that uses the cosmic microwave background (CMB), the leftover light from the Big Bang. The new Wisconsin report is part of the much bigger effort to better understand the large-scale structure of the universe. 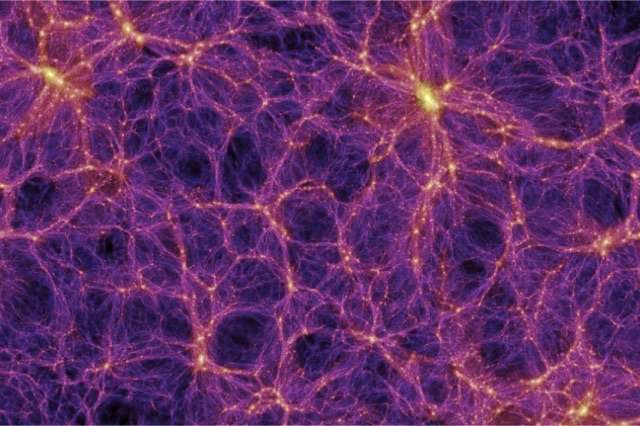 The structure of the cosmos is Swiss cheese-like in the sense that it is composed of "normal matter" in the form of voids and filaments. The filaments are made up of superclusters and clusters of galaxies, which in turn are composed of stars, gas, dust and planets. Dark matter and dark energy, which cannot yet be directly observed, are believed to comprise approximately 95 percent of the contents of the universe. From dark gravity to phantom energy: what's driving the expansion of the universe? "Celestial boondocks: Study supports the idea we live in a void"
"The new analysis made by Hoscheit, says Barger, shows that there are no current observational obstacles to the conclusion that the Milky Way resides in a very large void." FINALLY, finally DM Enthusiasts have something to hang their hats on for the reason we can't find Cosmic Fairy Dust anywhere near our galaxy , much less the Solar System..............WE LIVE IN A VOID !!!!! Who'da thunk? This is an interesting hypothesis, which can be probed using data currently being analyzed as we continue to build maps. I'm a little skeptical, though, given our membership in the Virgo supercluster. Wouldn't that indicate the cluster itself, is part of the void? Silly, clusters aren't part of voids. Think about it. It's like asserting there must be air in space. ..........or better yet, INFERRED GRAVITY. If the void is a billion light years in radius it could easily hold a structure as large as the Virgo super-cluster and still be called a void. The article does not say that it is, but unless we are right near the edge of the void a super-cluster centered only ~170 million light years away would be in the billion- light-year-void with us. Could the Virgo supercluster (and us along with it) stray into a void? Galaxies, clusters, and superclusters exist (mostly) along filaments and nodes, but they aren't nailed in place — there is still relative movement among all these wondrous beasties. Of course, I could be GRBursting up the wrong filament... (Sorry — I couldn't resist.) I am being serious, though; not at all sarcastic (not even a little bit). If the Virgo supercluster is drifting (or has drifted) into a void, what combinations of observations would most reliably indicate that (or not)? After all, it's not easy to locate oneself by looking from the inside out, only (not that we were given a choice in the matter) (pun intended). We aren't so well-placed that we can get a good look at objects that could be closer, but being in a void probably allows us to see distant objects more clearly, from a less-cluttered local environment. @RNP, awesome. That does indeed explain a great deal. Thanks, man! I think these scales really don't matter too much for where intelligent life can or cannot evolve. We're talking galaxy clusters, and the only scale that might still be applicable to hindering development of life is if star densities (not galaxy densities) gets too high in a certain region. High stellar densities would generate a high radiation environment and also make local gamma ray bursts so frequent that they are likely to repeatedly sterilize any upstart life before it can get far. High galaxy densities don't mean much in this context, since any 'catastrophic' interactions between galaxies happens on time scales that are long enough for life to evolve in the meantime. Yet again I am shocked at how much we have learned since I was a young boy who thought we had pretty much discovered everything that can be discovered. Even in filaments where the galactic density is far greater (presumably) than our own neighborhood I wonder what the average inundation by gamma ray bursts in any given area is. Perhaps the general conditions for complex life to evolve still remain undisturbed long enough in many locations. The beam of each gamma ray burst is still very narrow and concentrated. Regardless I still find it fascinating that we just happen to live within the largest coid we hav eso far detected. It would not surprise me if we find evidence before I die of even larger voids. That's basically why I don't see a preference for voids - even voids have some very dense clusters (just not as many), and even dense super-duper clusters have sparse regions within them. Therefore finding ourselves in 'the largest known void' leads me to suspect that it may be due to a highly biased sample of voids, or a measurement error, etc. People seem to be taking the terms cluster and void out of context. A void still has galaxies just fewer relative to other regions. Also our membership in the Virgo supercluster doesn't mean we aren't in a relative void compared to other regions. The local group is on the outskirts of the Virgo Supercluster (centered on the Virgo cluster) and even by supercluster standards, Virgo is pretty sparse and weak. But I would expect the numerous stars in dense regions to have plenty of planets that remain habitable for billions of years. If I had to guess it would be that the outer edges of the dense regions would have lots of stars and low galactic disruption, and hence be prime areas for plants habitable long enough for intelligent life. So, @RNP, we're on the outskirts of Laniakea, and the outskirts of the Virgo cluster. We appear from the video to be in a filament in a region that has some voids around it but is not, itself, in a void. So I'm still not sure about this article's assertion that we are in a void. Can you share more information that might make this clearer? See. It's amazing how well the thread will progress if you just ignore the nutters. Has anyone tried to model the matter distribution using fractal maths? The voids might actually be as prescribed by those equations as the matter densities. I wonder about that from the POV of extraterrestrial intelligence. If you were on a planet in a big star cluster, or Barard's star, doing most of the "getting there" bit of intrerstellar communication, might that not be a big advantage? What about globular clusters? Ancient, so any civs there would be well advanced, and it's much closer to the next star. Bottom line, is our whole "are we alone" existential obsession down to the fact that we know on some level that we're in an odd void? I agree with you that this is rather confusing, so my response below is tentative to say the least. It is important to note that, although they are called voids, super-void regions are NOT empty. Indeed, filamentary structures are often seen within them. (see Fig. 5 of https://arxiv.org...17.pdf). The designation is then based on the AVERAGE density over enormous scales. Thanks, @RNP. I guess I see some tension between these results and the results that seem to have thrown out the Cold Spot hypothesis of voids cooling the CMB that have been discussed here recently. I'm referring to the hypothesis that the Cold Spot is the result of late-time integrated Sachs-Wolfe effect. Is this a matter of degree? Are there enough voids around us to create the effect postulated here but not enough to create the Cold Spot? I guess I see some tension between these results and the results that seem to have thrown out the Cold Spot hypothesis of voids cooling the CMB that have been discussed here recently. There's not really any tension. What Mackenzie et al 2017 were looking for was voids along the line of sight to the Cold Spot. Any void causing the Cold Spot via the ISW effect cannot be to close or too far. It cannot be too far away as above z~1 dark energy was dominated by matter in the universe and you don't really get an ISW effect. The void also couldn't be too close as the Cold Spot is ~5 degrees in radius on the sky, the closer a void gets the bigger it's imprint would be on the sky. You could claim the void could simply be small and near but the magnitude of the imprint rapidly diminishes with smaller voids. Previous work indicated the void as at z~0.2, not z<0.07 as is discussed in the above work. They're looking at different distances essentially. Mackenzie et al actually mentions this z<0.07 under-density in the Southern Galactic Cap which is usually dubbed the "Local Hole", it's been known about for some time and they could see it in their data. There could be a very large nearby void which wouldn't create a Cold Spot like feature, it would make an ISW imprint but at very large scales the ISW effect is hard to measure. Mackenzie 2017 finds voids, just nothing capable of generating the Cold Spot. I'm very curious about the claim it can solve the H_0 tension as local homogeneity was one of the things Riess et al 2016 looked for but found nothing. Hopefully they write a paper. I should also say I'm quite sure I've never heard anyone call it the KBC void, particularly odd given that they weren't the first to suggest this idea which in fact stretches back more than 20 years before that 2013 paper. Thanks @IMP-9, I'll have to digest that a while but the net net seems to be, yes, this seems to be a matter of degree. I hope to post more after I've thought a while. I'm drastically exposing my ignorance here, but I don't mind. From what I've been able to understand, assuming my understanding understands correctly, baryonic matter seems to be concentrated along filaments, and is downright jam-packed at nodes (which makes sense if we assume baryonic matter is created by the mutual annihilation of dark matter particles, which itself assumes dark matter is particulate). Here is where I go wild: Could voids be caused not by less dark matter (resulting in less baryonic matter — perhaps), but by "quieter" dark matter; that is, dark matter that is self-annihilating at a less frantic rate, either because of, or resulting in, its density being more uniform? This implies that dark matter can be warmer or cooler, implying interactions with electromagnetic radiation. This is, at least (I think), consistent with pretty much everything being a matter of degree (or a degree of matter). Like, maybe, 14.7 billion years...? Err, you meant 13.7 billion years? Still better to live in the biggest void than to live in the 2nd biggest void.. those poor guys. Also it doesn't imply we're in the middle of this void.